Heat oven to 350°. Spray 2-quart casserole with cooking spray. 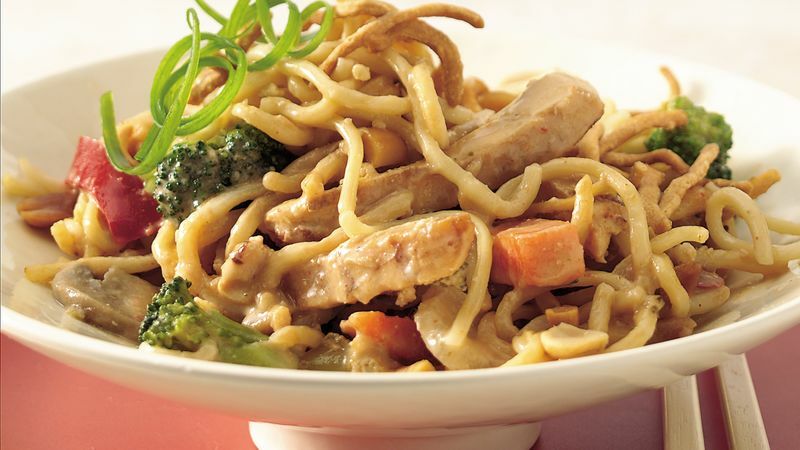 Cook peanut sauce, broth, peanut butter, frozen vegetables and stir-fry noodles in 3-quart saucepan over medium-high heat 5 to 7 minutes, stirring frequently, until hot. Stir in chicken. Spoon into casserole. Mix chow mein noodles and peanuts; sprinkle over chicken mixture. Bake uncovered about 30 minutes or until mixture is hot. Let stand 5 minutes. Look for refrigerated cooked stir-fry noodles near the produce in the refrigerator section of the grocery store. Can't find them? Use two packages of any flavor ramen noodles. Cook and drain ramen as directed on package, omitting the seasoning packet. Carefully separate the stir-fry noodles before adding them to the vegetable mixture. That way, the sauce coats all of the noodles. Thai cooking is known for its spiciness, and this casserole is no exception! Note that the heat level varies among brands of Thai peanut sauce varies. Experiment to match your heat tolerance.